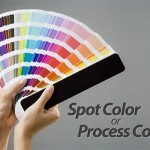 Process or Spot Colors in large format printing? Do you print using any Spot or Pantone colors for large format printing? We only print large format products in 4 color process (CMYK). If you specify Spot or Pantone colors they will be converted to the closest possible process equivalent. Our flatbed UV printer has the capability to print white ink adding many more exciting options to your print job.